Marshall is certainly no stranger when it comes to quality audio products, and this autumn would see the launch of the Marshall Voice with Amazon Alexa, where it will be followed by the Google Assistant later this year. While you might get all excited about it, there are better things to come as this is deemed to be but just the beginning as Marshall has bigger plans to introduce even more Marshall Voice speakers that sport other services down the road. For more than 55 years, each Marshall speaker churned out has chock full of technology and advancements underneath the hood in order to deliver an explosive sound that will make any room come alive with music. 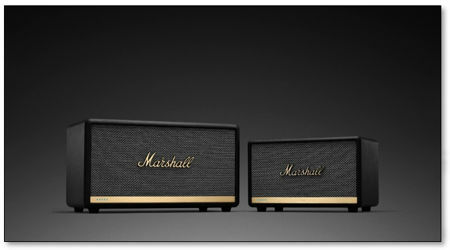 Each speaker will merge advanced components including class D amplifiers, a bass reflex cabinet system and custom-tuned drivers, making sure that performance is accompanied by perfect aesthetics via classic Marshall details such as a textured vinyl covering, salt & pepper fret and the iconic script logo. The first two Marshall Voice speakers that will be launched are the Acton II Voice with Amazon Alexa and Stanmore II Voice with Amazon Alexa, where either one is ideal for any kind of space, be it small or large. Expect the Stanmore II Voice with Amazon Alexa to retail for $399 apiece this October onwards, while those who would like the Acton II Voice with Amazon Alexa will be able to pick it up for a relatively more affordable price of $299. The power of Alexa integrated into these smart speakers will certainly make your life a whole lot easier while you work. If you are on a road trip and would like to sing your heart out to a particular song, but simply cannot remember the lyrics for the life of you, just let Alexa perform the search. In fact, things are so flexible with these smart speakers, you would be wondering just why didn’t you get one earlier on.